Ladytron in Mexico in 2011. From left to right: Reuben Wu, Mira Aroyo, Helen Marnie, Daniel Hunt. Ladytron are an electronic band formed in Liverpool in 1999. The group consists of Helen Marnie (lead vocals, synthesizers), Mira Aroyo (vocals, synthesizers), Daniel Hunt (synthesizers, guitar, vocals) and Reuben Wu (synthesizers). Their sound blends electropop with new wave and shoegazing elements. Ladytron described their sound as "electronic pop". Some of the group's songs performed by Aroyo contain lyrics written in her native Bulgarian. Their name was taken from the song "Ladytron" by Roxy Music. According to Brian Eno, once a member of Roxy Music, Ladytron are "the best of English pop music". Ladytron have released five studio albums so far: 604 (2001), Light & Magic (2002), Witching Hour (2005), Velocifero (2008) and Gravity the Seducer (2011). They also issued the live album Live at London Astoria 16.07.08 in 2009 and the compilation album Best of 00–10 in 2011. They have produced remixes for many artists, including David Gahan, Erasure, Goldfrapp, Apoptygma Berzerk, Placebo, Blondie, Gang of Four, Christina Aguilera, Nine Inch Nails, Bloc Party, Kings of Convenience, and Indochine. Liverpudlian producers and DJs Daniel Hunt and Reuben Wu met in the 1990s. Hunt also founded the indie record label Invicta Hi-Fi and a nightclub. Wu trained in Industrial Design at Sheffield Hallam University and graduated in 1997. He became an industrial designer at Team Consulting Limited, until finally going full-time with the band around 2002. Using the moniker Ladytron, Hunt and Wu recorded the debut single "He Took Her to a Movie" for £50 with the guest vocalist Lisa Eriksson (who later formed the band Techno Squirrels), The band name was inspired by the song "Ladytron" by Roxy Music. "He Took Her to a Movie" was released in July 1999 and gained positive reviews. In the summer of 1999, Hunt and Wu met the Scottish student Helen Marnie through various DJ gigs, and the Bulgarian student Mira Aroyo through a mutual friend. Marnie and Aroyo joined the band as vocalists and keyboardists. Helen Marnie studied music at the University of Liverpool where she received a Bachelor of Arts in pop music in 1999. Mira Aroyo was a postgraduate research geneticist in the Department of Biochemistry, University of Oxford. In December 1999, Ladytron issued the EP Miss Black and Her Friends in Japan only. It was followed in June 2000 by the EP Commodore Rock and in October 2000 by Mu-Tron EP. All the songs from these EPs, except "Miss Black" and "Olivetti Jerk", were later included on their debut studio album. "He Took Her to a Movie", Mu-Tron EP, "The Way That I Found You", were all selected as NME "Single of the Week". On 6 February 2001, Ladytron released the debut album 604 on Emperor Norton (US). The album was also released on 26 March 2001 on Labels (Germany) and on 2 April 2001 on Invicta Hi-Fi (UK). It was re-released on 20 July 2004 on Emperor Norton (US) and on 14 January 2011 (Germany)/18 January 2011 (US)/24 January 2011 (UK) on Nettwerk. 604 has been written mostly by Daniel Hunt and co-produced by him and Lance Thomas (who also engineered and mixed the album). The singles released from this album were "He Took Her to a Movie", "Playgirl", and "The Way That I Found You". The single "Playgirl" brought some national and international attention to the band. Until 2004, the band wore uniforms on stage. Daniel Hunt stated in 2001 that their uniforms were inspired by the science fiction movie The Andromeda Strain. In an interview with Chaos Control magazine from 2002, Hunt also said that the meaning of 604 album title is the area code for British Columbia. It's the area code for British Columbia... we're glad we've attached this strange importance to that number, it crops up everywhere now. We noticed when we stayed in Hamburg in Germany (in a hotel called "Commodore" – pure coincidence), that the number to phone reception from your room was '604'. Moments afterwards the building had caught fire and we were lucky to escape with our lives. I'm not joking. Ladytron also performed on 4 August 2001 at Festival Internacional de Benicàssim in Spain, on 10 August 2001 at La Route du Rock in France, and on 26 August 2001 at Reading Festival in the UK. On 5 December 2001, they performed four songs for Radio 1's John Peel Show: "Zmeyka", "Holiday 601", "Another Breakfast With You", "Discotraxx". On 1 October 2001, the compilation album Reproductions: Songs of The Human League was released on Carrot Top Records. This compilation included The Human League' song "Open Your Heart" covered by Ladytron. Their second album Light & Magic was released on 17 September 2002 at Emperor Norton (US) and Telstar (UK). The album was also released on 7 April 2003 at Warner Music (Germany) and on 21 June 2003 at Victor Entertainment (Japan). It was re-released on 20 July 2004 on Emperor Norton (US) and on 14 January 2011 (Germany)/18 January 2011 (US)/24 January 2011 (UK) on Nettwerk. Light & Magic featured a darker sound than their previous album. It was written and produced in Los Angeles by the band and co-produced by Mickey Petralia. The album included the underground hits "Seventeen", "Blue Jeans" and "Evil". They also issued in 2003 a limited 7" single, "Cracked LCD / USA vs. White Noise". They toured over a year to support the album. On 4 December 2002, Ladytron returned to John Peel Show and performed live the songs "True Mathematics", "Evil", "USA vs. White Noise" and "Blue Jeans". On 7 October 2003, they issued the mix compilation Softcore Jukebox on Emperor Norton. Besides the songs of other artists, the compilation also includes two of their own songs, the single remix of "Blue Jeans" renamed "Blue Jeans 2.0" and a cover of Tweet's "Oops (Oh My)". Ladytron began working on demos for their next album immediately after concluding Light & Magic tour with a homecoming gig in Liverpool in September 2003, where they were supported by Franz Ferdinand. Within a few months, they had mapped out the entire record. By the time they were ready to start recording in April 2004, their UK label Telstar Records had gone into administration. Their US label, Emperor Norton, also had problems: the company was purchased by Rykodisc in 2004 and was then shut down later that year, with Rykodisc inheriting its back-catalogue. The band announced on 7 December 2004 that they signed to Island Records. In 2004, Ladytron were booked to play a series of shows in China as part of an exhibition tour set up by the British Council. They played on 24 and 25 September 2004 in Shenzhen, 28 September 2004 in Chongqing, 6 October 2004 and 7 October 2004 (DJ set) in Shanghai. Witching Hour was recorded in 2004 at Elevator Studios (Liverpool, Merseyside) and it was produced by Ladytron and Jim Abbiss. The album featured Pop Levi on bass, live drums by Keith York and electric guitars mixed with their trademark sound. Pitchfork Media described it as a "quantum leap record". The songs "Sugar", "Destroy Everything You Touch", "International Dateline", "Weekend", and "Soft Power" were issued as singles. "Destroy Everything You Touch" ( sample) became the band's best known song. Without any real label support, Ladytron toured exhaustively over the next two years, on the strength of their cult following. They played in North America, Europe, and South America. In early 2007, they also opened for the European shows of Nine Inch Nails, at the invitation of Trent Reznor. In 2006 saw the light Extended Play, a two-disc EP CD/DVD compilation that features exclusive unreleased remixes and UK B-sides, as well as a 35-minute bonus DVD, that included a 27 minutes documentary titled Once Upon a Time in the East: Ladytron in China based on their short 2004 tour in China. In the same year Ladytron recorded The Harmonium Sessions, which contained four songs from their third studio album, performed unplugged. Ladytron were subsequently dropped by Island Records. They signed to Nettwerk in late 2007. On 2 June 2008, Ladytron released their fourth album Velocifero on Nettwerk. The album featured a heavier sound and it was recorded in Paris, with the band handling production duties with Alessandro Cortini (Modwheelmood, Nine Inch Nails, SONOIO) and Vicarious Bliss (Justice, DJ Mehdi). The band stated that "velocifero" literally means "bringer of speed" and is also the name of a classic retro styled scooter. The album spawned three singles: "Ghosts", "Runaway" and "Tomorrow". In mid-2008, the group composed three exclusive tracks for The Sims 3 game soundtrack: "Rockfalls & Estuaries", "She Stepped Out of the Car" and "Young Etruscians". These songs were performed in Simlish. On 6 April 2009, Nettwerk issued the remix compilation Velocifero (Remixed & Rare). In 2009, Ladytron toured North America with The Faint, and performed two special shows with Brian Eno at the Sydney Opera House. In the same year they announced that they will be the opening act for Depeche Mode on few concerts in Eastern Europe, but these concerts were cancelled due to Dave Gahan's illness. In the same year, Ladytron self-released their first live album Live at London Astoria 16.07.08. They also announced that they will produce some songs for Christina Aguilera. On 8 June 2010, Christina Aguilera's album Bionic was released. The deluxe edition included two songs co-written and produced by Ladytron: "Birds of Prey" and "Little Dreamer" (the latter only on iTunes Store). The soundtrack of the video game FIFA 11 included a new Ladytron song, "Ace of Hz", which was released as digital single on 30 November 2010. On 11 January 2011, the band issued the music download Ace of Hz EP, which contained the album mix plus 5 remixes. On 28 March 2011, it was released the compilation Best of 00–10, featuring 17 tracks on standard edition and 33 tracks on deluxe edition, plus an 80-page booklet. Both editions included two new tracks, "Ace of Hz" and a cover version of Death in June's "Little Black Angel". Also in 2011, Nettwerk reissued all their previous albums and released the remix compilation Best of Remixes. They released the iTunes video compilation Best of 00–10 Videos which included nine music videos for the singles "Playgirl", "Blue Jeans", "Seventeen", "Sugar", "Destroy Everything You Touch", "Ghosts", "Runaway", "Tomorrow" and "Ace of Hz". 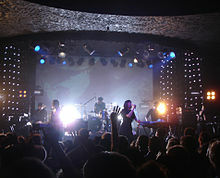 During April 2011 and July 2011, Ladytron performed live in Austria, China, Russia, Finland, Sweden, Poland, UK, Ireland, Hungary, and Spain. On 20 December 2011, Nettwerk issued the remix compilations 604 (Remixed & Rare), Light & Magic (Remixed & Rare) and Witching Hour (Remixed & Rare). Their fifth studio album, Gravity the Seducer, was released in the United Kingdom on 12 September 2011 and in the United States on 13 September 2011. The album was recorded in Kent's countryside and it was produced by the band and Barny Barnicott (Arctic Monkeys, Kasabian, Editors). Daniel Hunt said "Gravity the Seducer is more of a jump than the last album was, more ethereal and melodic, a touch more abstract in places than we've gone before, baroque 'n' roll". "Ace of Hz", which appears on the album, was previously released as a single from the band's greatest hits compilation Best of 00–10. The first single from Gravity the Seducer, "White Elephant", was issued on 17 May 2011 and its accompanying video was posted on YouTube on 26 July 2011. The band released two more singles, "Ambulances" on 16 June 2011 and "Mirage" on 8 August 2011. The music video for "Mirage" was posted on YouTube on 11 November 2011. During September 2011 and December 2011, the band toured in United States, Mexico, Canada, Brazil, Chile, Thailand, Indonesia, and Singapore. For the concerts in North America, Ladytron were supported by SONOIO, VHS or Beta and Geographer. The soundtrack of the video game The Sims 3: Supernatural included a new Ladytron song, "Tesla". Using her surname as stage name, Helen Marnie started in 2012 a solo career. She self-released through PledgeMusic her debut solo album Crystal World on 11 June 2013. The album was produced in 2012 in Reykjavík, Iceland by her bandmate Daniel Hunt in collaboration with the Icelandic musician Barði Jóhannsson. On 22 February 2013, the band premiered the "International Dateline" music video. It was shot in 2006 during Witching Hour era, left unfinished, rediscovered and finished by Daniel Hunt in 2012. On 29 November 2013, Ladytron released the remix album Gravity the Seducer Remixed, a collection of remixes of Gravity the Seducer songs. Ladytron featured shortly on the section "Resurgence" of the 2014 music documentary Beautiful Noise. This documentary also features several short interviews with Daniel Hunt. On 18 July 2016, the band posted on their official website that "After a five year hiatus following the release of their fifth album ‘Gravity the Seducer’, another chapter in Ladytron’s story is about to begin." All band members are also involved in various side projects. Besides touring, each member plays DJ sets (solo and with other band members) in clubs and events around the world. Ladytron have produced remixes for many artists, including David Gahan, Goldfrapp, Apoptygma Berzerk, Placebo, Blondie, Gang of Four, Christina Aguilera, Bloc Party, Kings of Convenience, Indochine, She Wants Revenge, Simian, Nine Inch Nails, SONOIO and Soulwax. Using her surname as stage name, Helen Marnie self-released her debut solo album Crystal World on 11 June 2013. In August 2013, the album was also released on Les Disques Du Crepuscule. Daniel Hunt worked on several movie scores, including that of Would You Rather starring Sasha Grey, in collaboration with Icelandic musician Barði Jóhannsson. Hunt also produced Marnie's album, Crystal World. In 2014, he started in São Paulo, Brasil the band Tamoios with singer Luisa Maita, and Fernando Rischbieter. Reuben Wu is an accomplished photographer. He posted a selection of photos on his own website and he also released in 2011 a book with a collection of photographs from an expedition with a friend on Svalbard in the same year. Hunt, Wu and DJ Revo opened the Liverpool club night Evol in September 2003. In September 2005, Hunt and Wu helped by some collaborators, opened the Liverpool bar/restaurant/music venue Korova. Mira Aroyo collaborated with John Foxx and the Maths for the song "Watching a Building on Fire". Ladytron are credited as producers and co-writers for the bonus songs "Birds of Prey" and "Little Dreamer" from the 2011 album Bionic by Christina Aguilera. Their sound is usually described as electropop with new wave and shoegaze influences. The band described their sound as "electronic pop". Ladytron focused on a balance between pop structures and experimental sounds. During the early years, Ladytron were labelled as electroclash by some music journalists, but they rejected this tag. We felt being compared to the day-glo trash-aesthetic of electroclash didn't make any sense. We were wise enough to know that being positioned by the press at the forefront of it, despite our protestations, would mean we bore the brunt of the backlash when it inevitably came. However, that happened anyway, and we survived. We were always lumped in with bands we sounded nothing like and often didn't have much in common with. That was what made us uncomfortable. For that reason, we just tried to avoid any connection with the term. Our sound is never reactionary to outside elements, it's always natural and down to experiences. Reuben Wu said about the process of making a new Ladytron album: "We start writing individually. We've never really lived in the same city before. We've always been geographically apart. [...] It's always been first as individuals, and then reviewing everything together, and then working on each other's songs. That's how we've always worked. And it goes well with how we make music. We do get together down the line and in the studio when we start fleshing out the tracks". There are four kind of Ladytron songs: sung by Marnie (sometimes with Aroyo on backing vocals), sung by Aroyo (sometimes with Marnie on backing vocals and sometimes contain lyrics written in her native Bulgarian), duets (usually Marnie and Aroyo, but sometimes Marnie and Hunt) and instrumentals. There have been six main Ladytron tours: 604 tour (2001), Light & Magic tour (2002–2004), Witching Hour tour (2005–2007), Velocifero tour (2008–2009), Best of 00–10 tour (2011), and Gravity the Seducer tour (2011). During the years, they toured in Europe, North America, South America, Asia, and Australia. The band played at various music festivals like La Route du Rock 2001, Reading Festival 2001, Festival Internacional de Benicàssim 2001 and 2005, Coachella Festival 2003 and 2006, Hultsfred Festival 2003, Arvikafestivalen 2003 and 2006, Lowlands Festival 2003, Dot-to-Dot Festival 2005, Pukkelpop 2005, Exit Festival 2005, Creamfields 2007, Electric Picnic 2007, Bonnaroo Festival 2008, Ruisrock Festival 2009, Traffic Festival 2009, Standon Calling Festival 2009, Electrosonic Festival 2009, Ping Gu Valley Festival 2011, Donaufestival 2011, Selector Festival 2011, Hegyalja Festival 2011, Decibel Festival 2011, DeLuna Fest 2011, Zouk Festival 2011. Since Light & Magic tour, Ladytron started to tour extensively and to add touring members to play live bass and drums. Previous touring members include Pop Levi (bass during Light & Magic tour), Andrea Goldsworthy (bass during Witching Hour tour), and Keith York (drums during Light & Magic tour and Witching Hour tour). Bands to open for Ladytron on their tours include Simian, The Presets, Client, Phaser, CSS, Asobi Seksu, Mount Sims, Crocodiles, Franz Ferdinand, SONOIO, VHS or Beta and Geographer. Ladytron have opened for other artists like Soulwax on their UK tour in 2001, Björk in 2003, and Goldfrapp in 2006. In early 2007, they opened for Nine Inch Nails on their European tour, at the invitation of Trent Reznor. In 2009, Ladytron and The Faint co-headlined a North American tour. Ladytron's current live equipment consists of Korg Delta played by Helen Marnie, Korg MS-20 played by Mira Aroyo, Minimoog Voyager played by Reuben Wu, Crumar Stratus played by Daniel Hunt and a drum kit played by the tour drummer Billy Brown (who also played during Velocifero tour). During the early part of Witching Hour tour, the band used to name their four Korg MS-2000B synths to easily differentiate them: Cleopatra (Marnie's synth), Babylon (Aroyo's synth), Ulysses (Hunt's synth), and Gloria (Wu's synth). ^ Krisher, Dan; Schirz, Tiffany (November 2007). "Ladytron On Roland". Roland. Retrieved 13 June 2011. ^ Newman, Scott (16 June 2010). "LADYTRON – An Interview With Reuben Wu". Voxy.co.nz. Digital Advance. Retrieved 13 June 2011. ^ a b Gourlay, Dom (8 March 2011). "DiS meets Ladytron". Drowned in Sound. Retrieved 13 June 2011. ^ a b c d Pytlik, Mark (22 November 2005). "Ladytron: Spell Bound". XLR8R Magazine. Retrieved 13 June 2011. ^ "Brian Eno talks about Ladytron (Luminous Festival 2009 – Sydney Opera House)". YouTube. 9 July 2009. ^ Hagen, Carmel (14 December 2008). "Ladytron". Format. Retrieved 22 August 2011. ^ a b "SVALBARD 12-inch version By Reuben Wu – Blurb". ^ "Reuben Wu". LinkedIn. Retrieved 13 June 2011. ^ "Techno Squirrels: Bio". Techno Squirrels. Retrieved 13 June 2011. ^ "Lisa Eriksson". LinkedIn. Retrieved 14 December 2012. ^ a b c "Home of Ladytronix". Archived from the original on 6 March 2001. ^ a b c "3/29 – Ladytron – 'Best Of: 00 – 10'". Nettwerk Press Blog. 14 February 2011. Retrieved 13 June 2011. ^ "Videovision: Ladytron interview". 2002. Retrieved 28 January 2012. ^ "The University of Liverpool: Insight Magazine: Autumn 2006" (PDF). Liv.ac.uk. Archived from the original (PDF) on 9 September 2014. Retrieved 14 December 2012. ^ a b "60 second interview: Ladytron's Mira Aroyo". Daily Record. Trinity Mirror. 1 June 2008. Archived from the original on 3 March 2011. Retrieved 13 June 2011. ^ "Rocklist.net...NME End of Year Lists 1999". Rocklistmusic.co.uk. ^ "Rocklist.net...NME End of Year Lists 2000". Rocklistmusic.co.uk. ^ "Rocklist.net...NME End of Year Lists 2001". Rocklistmusic.co.uk. ^ "Ladytron". Gale Musician Profiles. Answers.com. Retrieved 13 June 2011. ^ "Ladytron". Archived from the original on 26 July 2001. Retrieved 28 January 2012. ^ "Ladytron – Chaos Control Digizine". Chaoscontrol.com. Retrieved 14 December 2012. ^ "Peel Sessions: 05/12/2001 – Ladytron". bbc.co.uk. BBC. Retrieved 13 June 2011. ^ "Peel Sessions: 04/12/2002 – Ladytron". BBC Radio 1. BBC Online. Retrieved 13 June 2011. ^ "Ladytron". Archived from the original on 17 December 2005. ^ a b ": News :". Archived from the original on 6 December 2004. ^ "Witching Hour – Ladytron". Metacritic. CBS Interactive. Retrieved 13 June 2011. ^ "r a g e | Pop Levi". Abc.net.au. 29 September 2007. Retrieved 3 April 2012. ^ Pytlik, Mark (4 October 2005). "Ladytron: The Witching Hour". Pitchfork Media. Retrieved 13 June 2011. ^ Rogers, Jude (30 May 2008). "Ain't that a kick in the teeth?". The Guardian. London: guardian.co.uk. ^ "Ladytron joins Major Records and Nine Inch Nails on tour". Side-Line. 28 February 2007. Retrieved 13 June 2011. ^ "Ladytron Land New Label - IGN". ^ Weiss, David (1 June 2008). "Ladytron | Layer Cake". Electronic Musician. NewBay Media. Retrieved 13 June 2011. ^ "New Ladytron record brings fans up to speed". 2 June 2008. Retrieved 28 January 2012. ^ Raggett, Ned (27 February 2009). "Interview: Ladytron –". The Game Reviews. ^ Neyland, Nick (6 February 2009). "Ladytron and the Faint Co-Headlining North American Tour". Prefix. Retrieved 13 June 2011. ^ "Brian Eno Curating Sydney Music Fest". Synthtopia. 26 March 2009. Retrieved 13 June 2011. ^ Raggett, Ned (23 April 2009). "Ladytron May Be Dark and Moody, But Don't Call Them Goth". OC Weekly. Village Voice Media. ^ "'Best of Ladytron: 00-10' Available Now". Nettwerk Press Blog. 29 March 2011. Retrieved 13 June 2011. ^ "Best of Videos 00-10 Out Today on iTunes van Ladytron op Myspace". Myspace.com. Retrieved 3 April 2012. ^ a b c d e f g h i j k l m n o p q r "Ladytron's Concert Listing". Retrieved 29 December 2011. ^ a b "Ladytron Announces Studio Album, 'Gravity The Seducer'; Set For Release Sept. 13th | Nettwerk Press Blog". Nettskinny.com. Retrieved 3 April 2012. ^ "Ambulances – Single by Ladytron". iTunes Store UK. Apple Inc. Retrieved 6 February 2015. ^ "Mirage – Single by Ladytron". iTunes Store UK. Apple Inc. Retrieved 6 February 2015. ^ "The Sims 3 Supernatural Soundtrack". 7 August 2012. Retrieved 8 August 2012. ^ "RECORD STORE DAY - SpecialRelease". ^ "Revo DJ - Electro, Punk, Techno". ^ "Profile: Liverpool Korova - Urban Undiscovered". The Guardian. London. 2 March 2009. ^ Laurence, Alexander (19 June 2008). "Ladytron Interview 2008". The Portable Infinite blog. Retrieved 13 June 2011. ^ "ROCKSUCKER: Interview: Ladytron". Jonnyabrams.blogspot.com. 19 August 2011. Retrieved 14 December 2012. ^ "Interview: Ladytron's Reuben Wu - Shanghai - Shanghai Blogs Blog - City Weekend Guide". Retrieved 31 March 2013. ^ "Fashion Don'ts: Liverpool's Ladytron Clashes with Electroclash – Baltimore City Paper". Retrieved 29 December 2012. ^ "Artist Details". Korg. Retrieved 29 December 2012. ^ "Ladytron". IMDb.com. Retrieved 14 December 2012.